Heidi was hot, they had a lot in common and she had a way of seeing the world that was different, but complementary, to his, says Bud. 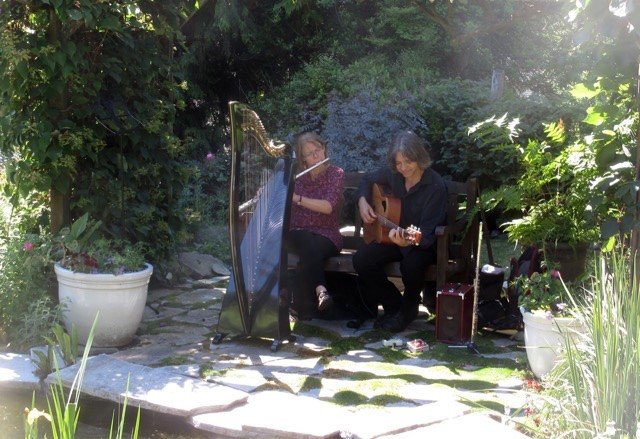 Thirty-seven years (and two daughters) later, the Kurzes continue to make music together on the Sunshine Coast, mostly classical and Celtic, sometimes performing as Double Treble. Heidi spent her high school years in Mission, B.C., and then studied nursing at Vancouver General Hospital. Nursing students there didn’t pay tuition, received room and board and were paid $10 a month. As sweet as that sounds, Heidi didn’t much like the smell of hospitals. Nursing, she discovered, was not her calling. Heidi had taken piano lessons as a child, played guitar and had picked up the flute in nursing school. She was working among artistic and musical colleagues at a small lodge in the Rockies when she applied to Cap. Heidi recalls how beautiful the North Shore campus was but she and Bud agree it was the people, some of whom they still see, that were the best part of their experiences. “It was very relaxed and very supportive and there were people rooting for you to get it right,” Bud says. That CapU support continues through the generations: the Kurz’s daughter Celina earned a Bachelor of Music in Jazz Studies from Capilano University, graduating with distinction in 2013.